Despite my love of Disney's Animal Kingdom, I've never been the biggest fan of the Africa section of the park. The theming is totally perfect, but something about the area has never been entirely conducive to lingering. There is only one real attraction here (which we usually experience first thing in the morning...) and there really isn't anything for us to eat besides Tusker House, which you need a reservation for. I was prompted to explore the area with a renewed gusto after our recent Wild By Design tour. Our guide seemed to have a personal affinity toward this area, and she took the time to explain some of the terrific hidden details. One of the more out of the way areas in Africa is a seating area behind Tamu Tamu Refreshments. 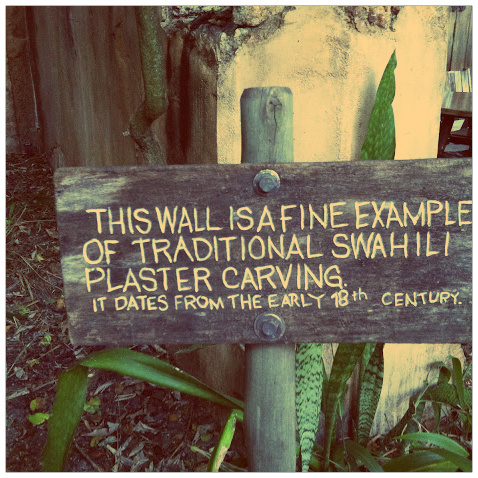 This area not only holds the very special sausage tree, but also a "fine example of traditional Swahili plaster carving" which really suits the atmosphere of the area well. This type of architecture is in fact a more modern Swahili craft...by which I mean, it developed in the last couple hundred years. There are fine antique examples scattered throughout Kenya, but the majority are around the Lamu Archipelago located on Kenya's northern coast.